No, not me. (TMI!) STARBUCK. Read on. This continuing meme got me thinking of how this could apply to so many things. Like Battlestar Galactica and the love triangle between Starbuck, Lee “Apollo” Adama and Sam Anders. Hey, I’ve been completely honest about my geekdom, but if there was any doubt…click on the more link below. Just remember parody is the highest form of flattery. Starbuck: Hey SamÃ¢â‚¬Â¦it’s me. I’m in ahh, a hotel at Cloud 9Ã¢â‚¬Â¦I don’t know I’ve been “dead” for so long I..I don’t even know what planet I’m on any more to be honest. Anyway, I’ve been thinking about you a lot, and ahh, I’ve been needing to tell you something. I don’t know why I haven’t but it’s important, I mean we’ve been together for so long, since New Caprica when we got those matching tatts. I still haven’t told you and it’s just not right, so here it goes. Boys: Who’s that knocking at my door? Girls: I’m frakking Lee Adama! Boys: She’s frakking Lee Adama! President Roslin: It’s true, I have confirmed via a vision that she is in fact frakking Lee Adama and will continue to do so until we reach Earth. Starbuck: [Remember when] I told you I was frakking Lee Adama? I WAS frakking Lee Adama. Starbuck: I love Ron Moore! Starbuck: So, that’s itÃ¢â‚¬Â¦ummÃ¢â‚¬Â¦.I think I was clear? Lee Adama: No, you did great. 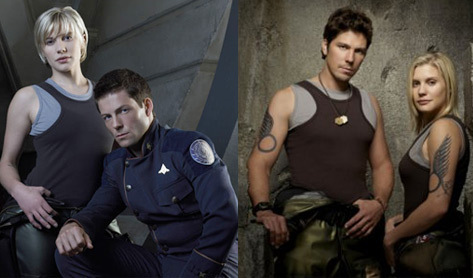 Lee Adama: Pretty damn good. Lee Adama: You know what? Stop right thereÃ¢â‚¬Â¦.Sam we’re out of timeÃ¢â‚¬Â¦sorry. Starbuck: [laughs] You are soo bad! Lee Adama: A little bit, let’s put that guitar down and go frak in my bunkÃ¢â‚¬Â¦See ya Sam.